Pitted keratolysis or PK was first described in a Ceylonese patient in 1910, by Castellani as keratoma plantare sulcatum secondary to yaws. [1,2] The condition is caused by a cutaneous gram positive bacterial infection linked to both the Corynebacterium and Actinomyces species. [1,2] This disorder is characterized by keratomatous pitting of the skin usually to weightbearing regions of the foot, such as the forefoot and heels. The differential diagnosis in our quiz included arsenical keratosis, keratosis punctata, keratosis pilaris, intractable plantar keratosis, porokeratosis plantaris discreta, hyperhidrosis and bromohidrosis. Keratosis punctata is a dominantly inherited disorder that develops between the ages of 15 and 30. The condition will last a lifetime. These lesions are more punctuate, as the name implies and will not disappear when superficially debrided as in pitted keratosis. Intractable plantar keratosis or IPK is usually an isolated hyperkeratotic lesion under a metatarsal head. These lesions are large and measure up to 20-30mm in diameter. These lesions are sometimes confused with porokeratosis plantaris discreta, however, porokeratosis is a much smaller hyperkeratotic lesion that can reach a depth of 1.5mm or more. It can also be associated with non-weightbearing surfaces, unlike the IPK. Treatment of pitted keratolysis can include localized debridement of the overlying epidermis and topical drying agents with oral and topical antibiotics. Topical drying agents can include Drysol or aluminum chloride hexahydrate. Roll-on antiperspirants such as aluminum chloride have also been described. Zeasorb super absorbent powder to address the hyperhidrosis can also be useful. Oral antibiotics to treat the underlying infection are also indicated when treating PK if the condition is resistant to topical antibiotic treatments. The oral and topical antibiotic of choice is clindamycin. Antibacterial gels or creams such as clindamycin, erythromycin and mupirocin has also been described. Twice daily applications of these topicals for 2-3 weeks will usually clear the lesions. In other cases, botulinum toxin injections have been shown to be effective. The overall prognosis is excellent when properly treated. 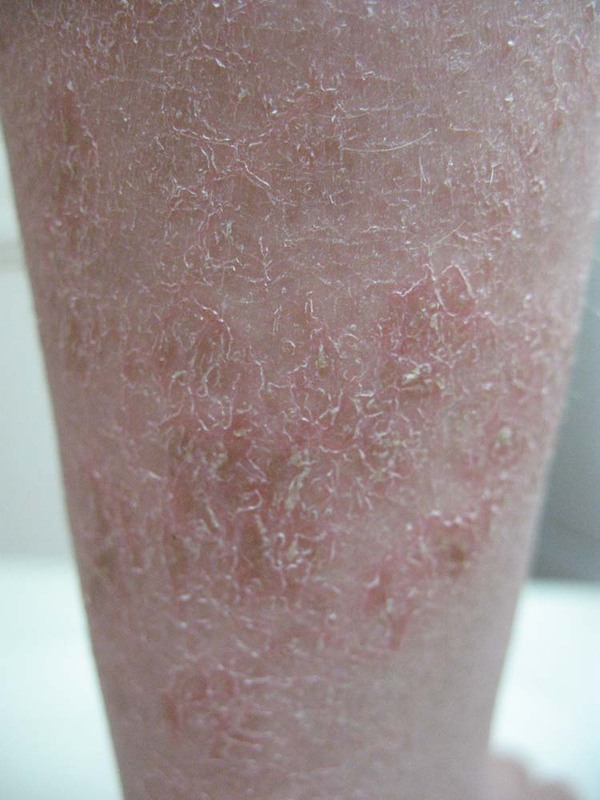 The patient was prescribed erythromycin 2% cream for two weeks. 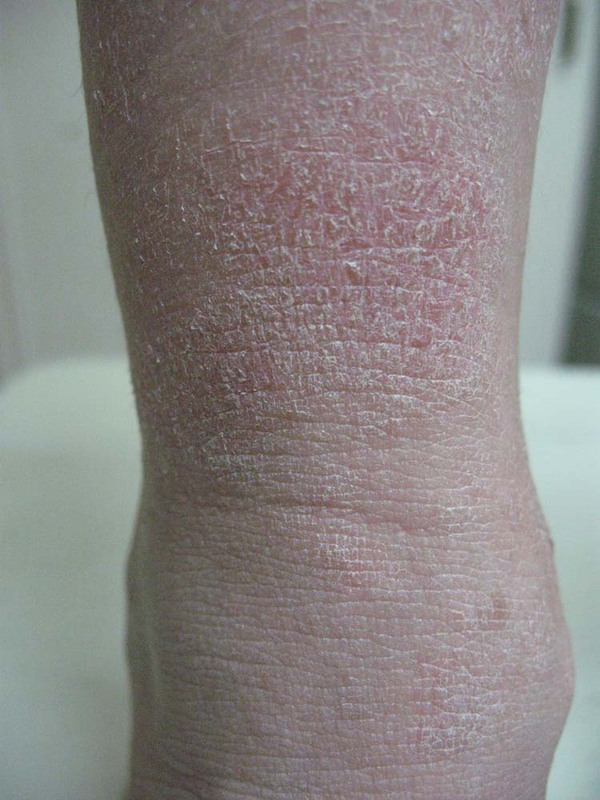 She was advised to keep her feet dry and use talcum powder after the application of erythromycin cream. After having the condition for over a year, the condition resolved promptly after 2 weeks of topical treatment. 2. Singh, G., Naik, C.L. : Pitted Keratolysis Indian Journal of deratology, Venereology and leprology, 71(3), 213-215, 2005 [open access]. 3. DermNet NZ: Pitted keratolysis, [online], 2008. 4. Hermanns-Le, T., et al. : Pitted keratolysis: New Ultrastructural Insight in Keratohyalin Granule and Corneodesmosome Alterations. Exogenous Dermatology, 3(3), 2004. 5. 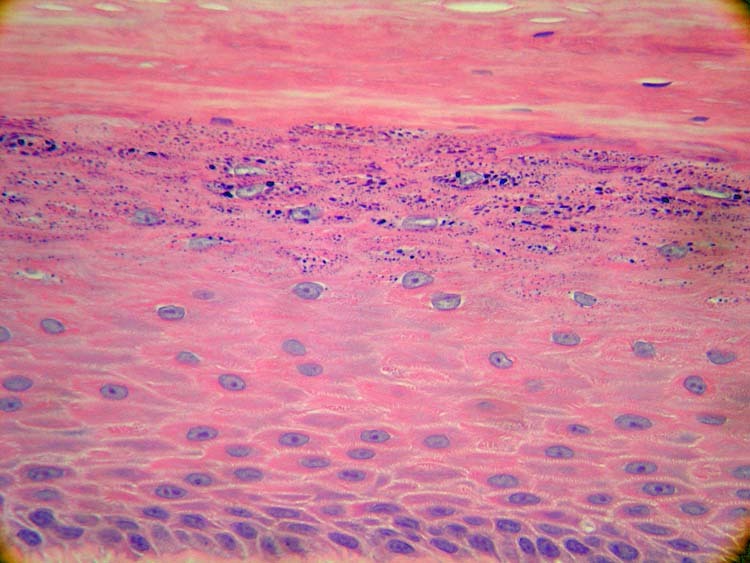 American Osteopathic College of Dermatology: Pitted Keratolysis [online], 2008. 6. Dockery, G., Crawford, M.E. : Color Atlas of Foot & Ankle Dermatology, Lippincott-Raven, 1999. 7. Chen, Chi-Shen J.: Arsenical Keratosis, eMedicine, [online], 2008. 8. Alai, N.: Keratosis Pilaris, eMedicine [online], 2008. 9. 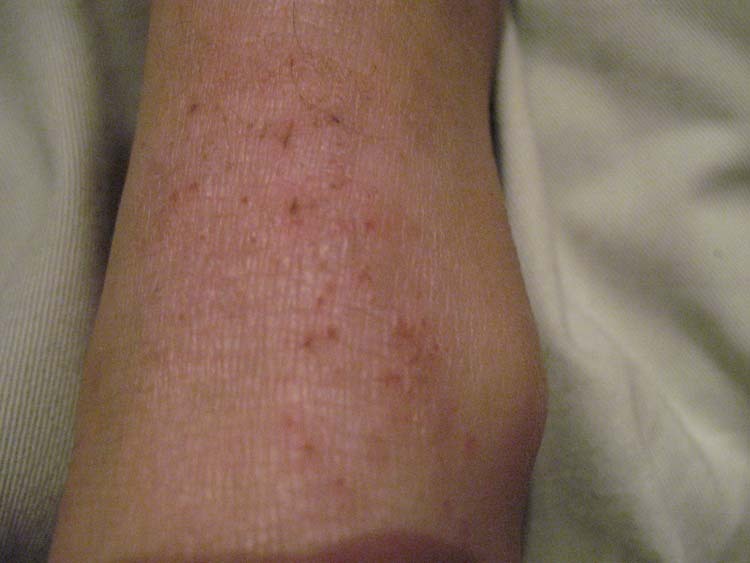 Kline, A. Keratotic Skin Lesions of the Foot, The Foot Blog, [online], 2006. Address correspondence to: Al Kline, DPM. 3130 South Alameda, Corpus Christi, Texas 78404. Adjunct Clinical Faculty, Barry University School of Podiatric Medicine. Private practice, Chief of Podiatry, Doctors Regional Medical Center. Corpus Christi, Texas, 78411. A 21 year old female presents with unusual ‘pits’ along the bottom of the forefoot. (Figs. 1) The patient states that she has had the condition for over a year. She relates to going bare-footed and wearing sandals whenever possible. There is an associated pungent odor to her feet. She relates to having to wash her feet often. The patient initially thought it was just dirt that “didn’t wash off” in the bath. She became more concerned when the lesions and dark brown pits would not go away. Figures 1 Dark-stained appearing pits to the bottom of the forefoot. The patient attributed this condition to her feet getting dirty while going bare-footed. However, it appeared that the ‘dirt’ would not wash off. The patient’s medical history is unremarkable. She is allergic to Ceclor®. She does not take any prescription or over-the-counter medications. Figures 2 Closer clinical examination reveals tiny hollow pits and small craters within the epidermis. Simple debridement does not reveal deeper keratosis. Question: Based on the patient’s clinical history, which of the following is the correct diagnosis? Pediatric Atopic Dermatitis (PAD) or eczema is a term commonly used to describe inflamed, dry and itchy skin. 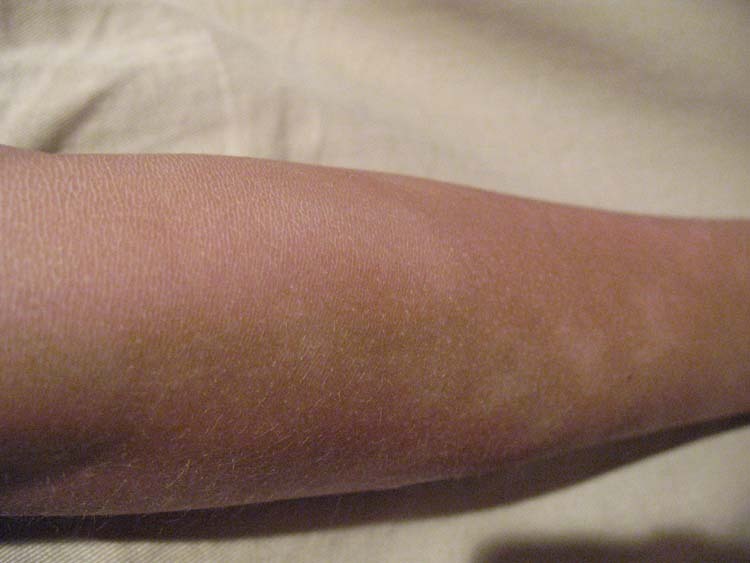 The hallmark of the condition includes excessive skin dryness and itching causing lichenification primarily to the flexural regions of the arms and legs. The condition most commonly occurs in infants, children and young adults. The condition is particularly pruritic in nature and can be associated with other conditions such as asthma, allergic rhinitis, allergies to food and increased IgE. Food allergy to eggs, milk, peanuts, soy, wheat, tomatoes, oranges, chocolate and seafood can cause PAD. [1,3] The condition is of unknown origin, but is thought to be familial in nature. The condition affects about 10 percent of children and 3 percent of the US population. Onset typically begins within the first year of life in 60 percent of the cases and 85 percent within the first five years. It is particularly severe in the winter months and often is referred to as “winter’s itch.” The condition most often resolves spontaneously in children as they enter adulthood. 1) In infancy to two years of age, the skin is manifested by red, weeping, crusted lesions to the face, scalp and extremities. 2) In childhood (2-12 years of age), atopic dermatitis typically appears in the skinfold areas, especially the front of the elbow, back of the knee, inside the wrist and depressions along the ankles and neck. 3) In the adult stage, from puberty onward, people with atopic dermatitis may either have a few or no skin problems since infancy, or may have suffered a chronic relapsing course with periods of remission. 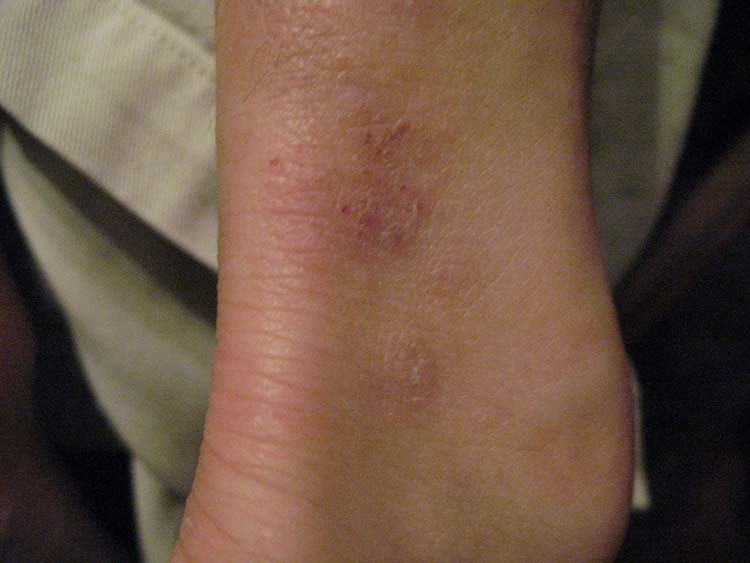 There are often regions of thick, red skin caused by frequent scratching. In this stage, atopic dermatitis typically appears behind the elbows and knees, on the eyelids, neck, hands and wrists. Treatment of AD consists of daily skincare hydration and decreasing inflammation. Skin hydration can be achieved by applying a variety of skin moisturizers. Avoid lotions that contain water and alcohol as these tend to increase skin dryness. Patient’s suffering AD should never shower or bathe in hot water. Always wash the skin in luke warm water applying the moisturizer within three minutes of washing. This helps the moisturizer penetrate the skin up to ten times better than applying it directly to dry skin. Special soaps can also be used including Cataphil®, Oilatum, Aveeno® and Neutrogena®. Lotions that help moisturize the skin include Eucerin®, Neutraderm, Lubriderm®, Keri®, Curel®and Moisturel®. Children should avoid sudden changes in temperature or contact with harsh chemicals and fragrances in waters, soaps and lotions. Children should also wear breathable fabrics such as cotton to avoid flare-ups. When sleeping, avoid wool, electric and heavy blankets that may cause night sweats that can irritate AD. Topical corticosteroid creams and sprays are the mainstay of treatment in PAD. We have found two topical corticosteroids that work the best. Clobex® spray 0.05% (clobetasol propionate) works best in areas of acute inflammation, especially in the flexural regions of the skin of the lower and upper extremities. For PAD in sensitive regions of the skin such as the face and groin, Desonide Lotion 0.05% applied twice daily works wonders. Remember, most children will improve over time with proper treatment. It is important to keep a moisturizing treatment regime as a daily routine. If is also important to see your dermatologist or extremity skin specialist in cases of severe AD. If treatment fails, see your allergist to determine other possible allergic causes of AD. 1. Krafchik, B.R. Atopic Dermatitis eMedicine [online], 2008. 2. American Academy of Dermatology [online], 2008. 3. Iden, D.L. Facts about Pediatric Atopic Dermatitis, correspondence, 2008. The child’s parents relate to the brothers having the scaling on and off since the children were about 4 or 5 years old. Flare-ups would often be exacerbated during the summer and winter months. In the summer, the children would often swim in the family pool and develop severe regions of itching to both extremities. It was particularly severe in areas of skin folds, particularly to the anterior ankle and back of the knees. In the winter months, the skin would not stay hydrated enough, and the skin would typically get very itchy and secondarily infected from scratching. This would leave the skin with crusts and lichenified regions of skin after scratching. A 13 year old female presents with a two year history of a “lump” to the bottom of the right forefoot. The patient reports pain, discomfort when walking and exercising with no history of trauma. The patient plays sports and enjoys running and basketball. She is involved in multiple track events including the discus and shot-put. There is increasing pain and swelling to the plantar forefoot region. 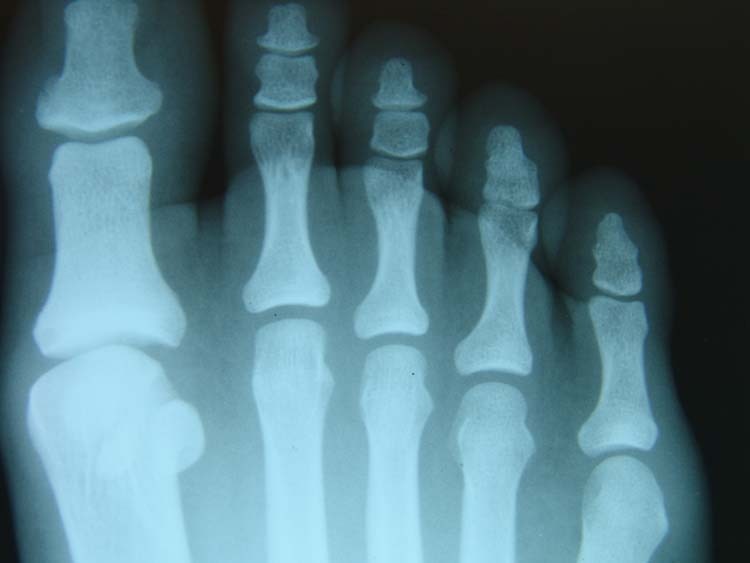 Figure 1 Swelling seen in the region of the plantar third metatarsal head region. The swelling is firm and painful to palpation. A multiplanar, multiecho pre and post contrast MRI of the forefoot is provided for review (15 cc gadolinium). The MRI revealed a 8 x 14 x 28mm, well circumscribed cystic focus plantar to the third MTP joint. No significant contrast enhancement is identified. The adjacent third MTP joint is preserved. The remaining metatarsal phalangeal joints are unremarkable. 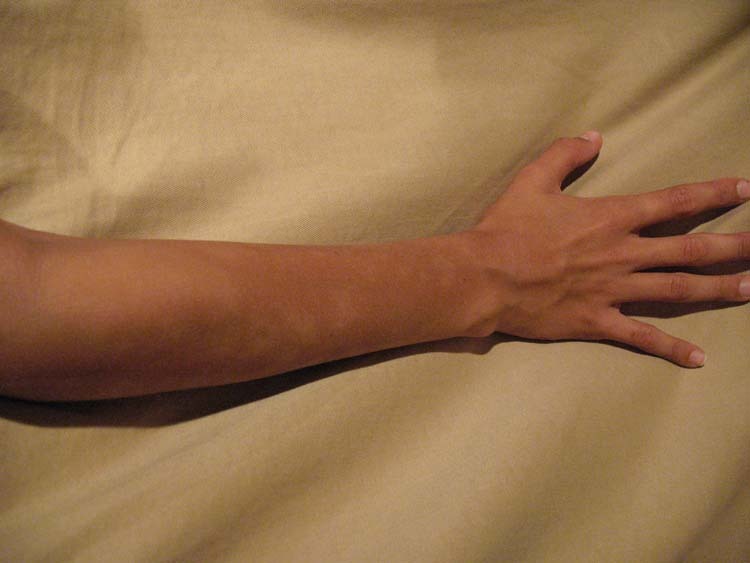 The visualized extensor and flexor tendons are intact. Figure 2 A firm soft tissue mass was removed. The mass appeared to be located in the subcutaneous layer along the plantar surface of the third metatarsal head. 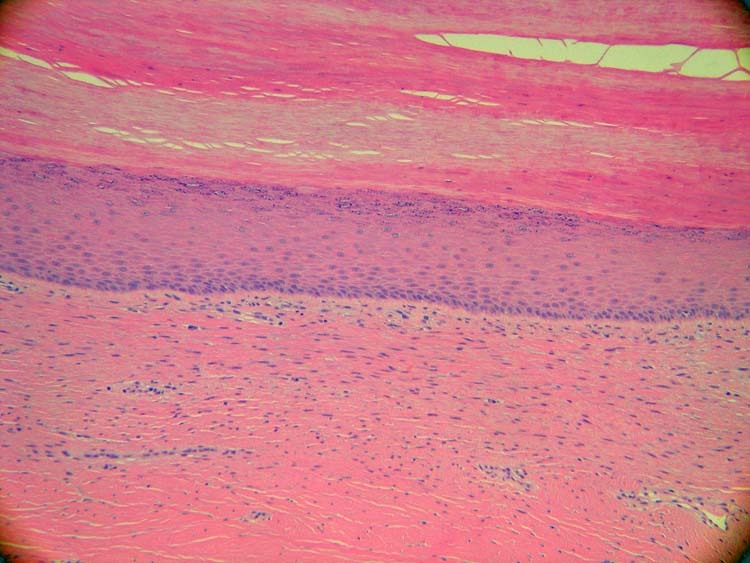 Figure 3 Sections showed keratin-containing features with focal histiocytic reaction in the adjacent stroma. Question: Based on the patient’s history, physical exam, radiological tests, surgical findings and pathology report, which one of the following is the correct diagnosis?